We supply the market with a new technique for solar panels. With SolarCell Clear you can maximize your solar panels capacity. By melting snow and ice your panel`s become available and ready for use all year round. 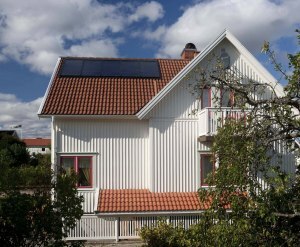 The product is patented, CE approved and tested by SP Sveriges Tekniska Forskningsinstitut för nordiskt klimat (The Swedish Technical Research Institute for Nordic climate). Are you maximizing the use of your solar energy system? Would you like to reduce your electricity bills? Would you like to reduce your negative impact on nature? Do you want more time for family and friends? Do you want to work less and enjoy more of life? If you have answered yes to any of the above questions our product could be beneficiary for you. Replace the glass on your solar panel with our SolarCell Clear glass and you are ready to use your plant all year round. Contact an electrician to install the SolarCell Clear glass. This is required for the product to work properly and safely. Our product is eligible for reduction in labor costs (ROT avdrag). Our product, the SolarCell Clear glass, melts snow and ice every day on your solar panels during the winter and makes it possible for you to take advantage of the sun’s rays even on a beautiful day in February.